The short film “Struggles Within” has added to its credentials at film festivals. 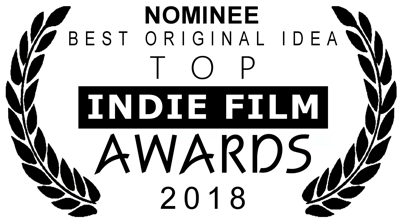 The film has received two nominations for awards at the 2018 Top Indie Film Awards. The film was nominated for “Best Experimental Short” and “Best Original Idea”. In the final results “Struggles Within” was beat out in both categories by other films. But the entire cast and crew of the film are honoured to have been selected for the festival and to receive the two nominations. These two nominations build on the films win in the category of “Best Experimental” at the Fall Edition of the Alternative Film Festival in Toronto. The production team was very pleased with these nominations especially the “best original idea” nomination. The film is turning heads as it speak to people in the international language of dance and drama with very few words explaining the message. Something that the film’s co-producer and iFilmGroup co-founder Matthew Marshall feels is strength and a weakness in the film. “The strength is that language is not a barrier in the film for people to see it, relate to it and understand from around the world. The weakness is even with the updates and added images some people still are struggling with what the film is about” says Marshall. That has been seen in a few film festivals who have not got what the film is trying to say. But for the most part anyone who suffers with depression or anxiety is understanding the film and feel that the message is right on point. One viewer had this to say about people or festivals that are not getting the message. “If you see the film and you don’t understand it, then you yourself or no one near you has struggled with depression, anxiety and suicidal thoughts. This film has its finger on the pulse of what it is like to deal with the inner demons in your head and what visually it looks like to have and deal with depression on a daily bases.” says Alexis G.
The film is a 14 minute telling of a “story through almost all music and dance” about a girl struggling with depression and contemplating suicide. It’s about her choices to find the hope to continue to live. “The story is told through the thoughts of the main character”, Marshall says. The film is a timely story that speaks to what many people in society are struggling with. It's done in a way that words do not fill the story, but images, dance and music do, so the viewer can “feel” the story being told on screen. It also can be related to, if the person watching has had experience in their life either personally or through a member of their family with the issue of depression or mental illness. Many who have seen the film feel it shows what many people “feel” in struggling with depressions and mental illness. “Struggles Within” is written and directed by Corrinne Wood a Chatham native. “Mental illness is something really near and dear to my heart, and this film is designed to show an audience who may not be struggling with a mental illness what kind of daily struggles really goes on inside the mind of someone struggling with depression”, says Wood. The film was a collaboration between IME Films, m & s Marshall Productions and iFilmGroup. Filming of the project became a story onto itself of life imitating the art being created. “The film became about this group of people who had an understanding of depression and mental illness through life experience or association with people who had been through it. The team wanted to share the message …that it’s OK to struggle. That through talking and communication about the issue we can help each other,” says Marshall. “Struggles Within” was filmed and features dancers, actors and crew from St. Thomas and London. Since its release the production team has received many messages and responses from people who suffer with depression and mental illness saying how much they enjoyed the production and how much it has spoken to them. “We are touching lives with the film and that is something very special” says Marshall. Marshall is known for making and being a part of films that speak to people on various levels. Especially emotionally. “a film by Matthew Marshall always makes you think and gives you something to digest after watching it. They generally evoke a reaction or emotion” says Don Hickey, co-founder of iFilmGroup. Hickey feels that it is something that both he and Marshall share. The ability to make stories that have a very human aspect and teach a life lesson and cause a person to think. “It really is at the heart of the iFilmGroup mission to help those involved learn and grow as they journey through life. “Struggles Within” has been entered into a number of other film festivals with a focus on festivals that have themes of mental illness and dance. Because of its unique style, structure and look the film is outside the box of traditional films and is fitting best into the experimental category more than the short film category. Once it is finished being entered into festivals the team would like to give the film to organizations who deal with mental illness as a DVD that can be watched by others so the emssages included in the film can be shared with others who struggle. “to be able to share with others and have them see that it is ok to struggle, is a very power thing that we can pass along,” says Marshall. He goes on to say. “We feel that what our team has been through personally is very much what many others are going through in their lives. Because the story has almost no words everyone can relate to what is being shown on the screen,” Marshall adds. The team feels that these two newest nominations are just another step in where this film is headed and the lives that it will change in the process.